Pale pastel flowers in shades of blue, pink, white and lavender, are mixed together like shards of colored glass. A breath of spring to adorn her. 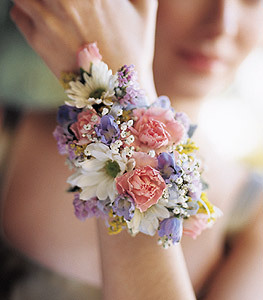 An elastic-style wristlet with pink miniature carnations, light blue delphinium, white daisy chrysanthemums, baby's breath, solidago, statice and ivy. Page loaded in 0.5328 seconds.